Considered two of the top 10 coastal cities in the world vulnerable to flooding and storms, Miami and Tampa have been bracing for Hurricane Irma, but a new forecast says it is Tampa that will face a head-on collision, with possibly catastrophic damage. Irma has reached the Florida coast. Tampa, which last witnessed a major hurricane almost a hundred years ago, risks failing the Irma test with an ominous forecast estimating the damage at half a million homes and hundreds of casualties. Contrary to earlier predictions that Hurricane Irma – after ripping through French overseas territories and Cuba’s northern shores – would steer towards Miami for a direct hit, the latest forecast indicates that Florida’s western coast is about to bear the brunt of the storm. The hurricane, upgraded again to a category 4 storm, is expected to regain lost momentum as makes landfall in Florida. “For five days, we were told it was going to be on the east coast, and then 24 hours before it hits, we’re now told it’s coming up the west coast,” Jeff Beerbohm from St. Petersburg, Florida, told AP. Houses in the Tampa Bay area, which has roughly three million residents, are especially vulnerable, not only due to the last-minute evacuation orders, but also because the region has been spared by hurricanes of comparable power since 1921, when it was struck by a category 3 hurricane. At that time, the area only had a population of around 10,000. The long disaster-free period spanning almost a century has had an adverse effect on Tampa’s preparedness to withstand calamity, a 2010 study, carried out at the initiative of Tampa’s regional planning council, showed. The study, which simulated the effects of a category 5 hurricane on the area’s infrastructure and population, estimated that it could result in over 2,000 casualties and damage half a million homes and businesses. The city of Tampa did not fare better in a World Bank survey from 2013, where it, along with Miami, was singled out as one of the 10 cities in the world at highest risk of flood damage in terms of overall cost. Tampa was named the city most vulnerable to flash flooding in a 2015 study by Boston firm Karen Clark & Co, which said that due to the city’s location on the bay, a “large funnel” could be generated, helping the storm to gain power. The total losses from a hurricane could reach $175 billion for the Tampa area alone, the study found. 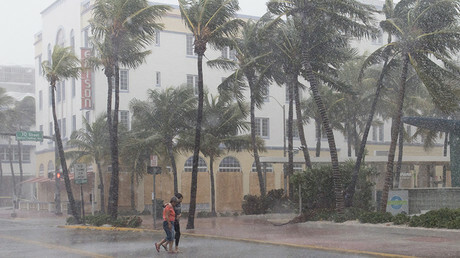 Miami should not feel much safer, as “only 70 miles of the panhandle is not under a hurricane warning,” according to Ryan Maue, meteorologist from WeatherBell Analytics, as cited by ABC News. He added that 20 inches of rain is expected to fall in the Miami area. Earlier in the week, Miami city officials urged citizens to avoid staying in buildings next to the more than 20 construction cranes in the city, as they could potentially collapse in gusts of wind exceeding 145 miles per hour. City manager Daniel Alfonso said the authorities would not be able to dismantle the cranes, despite being notified of the looming calamity a week beforehand, adding that five to six days are required for one crane to be removed, WLRN reported earlier this week. Some construction cranes were already seen spinning on Saturday. Meanwhile, Irma has hit the Florida Keys, a chain of islands off the southern tip of Florida, with hurricane-grade winds. While most Florida residents in evacuated areas opted to leave their belongings behind to reach safety, some people in the southernmost city of Key West have refused to evacuate, even though half of the island may end up under water. “They’re putting their lives in danger,” Key West Police Chief Donald Lee told MSNBC on Saturday, urging everybody to evacuate.